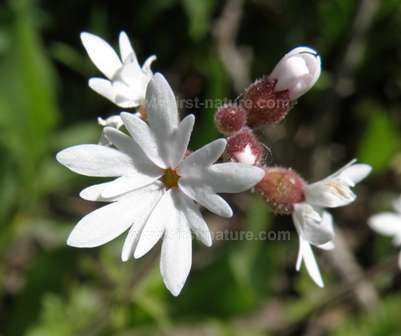 Above: Woodlandstar, Lithophragma parviflorum is one of the rarer Rocky Mountain wildflowers. This lovely wildflower, with its brilliant white star-like flowers, is widespread but quite rare. Woodlandstar is a member of the Saxifrage family and has round, deeply lobed leaves. The flower stems grow to around 35cm in height, and each stem carries several flowers. It is the three-lobed petals which overlap each other that give this flower its almost square symmetrical shape. The plant flowers in late June and well into July. It can be found in the foothills of the mountains in meadows and scrub areas, and also on the edges of submontane forests. It also grows in the stony clefts of rocky slopes. The specimen on this page was photographed in Yellowstone National Park in early July.